This recipe comes from The Elsted Inn, Lisa and Malcolm King's jewel of a country pub set at the heart of the South Downs near Midhurst, a favourite with walkers and locals thanks to its fresh, seasonal and local menu and its selection of the UK's best ales. Malcolm will even drive out to pick up weary hikers by arrangement and return them to the Elsted Inn for a good feed and a few beers – and the renovated bedrooms are the perfect place to rest the night. 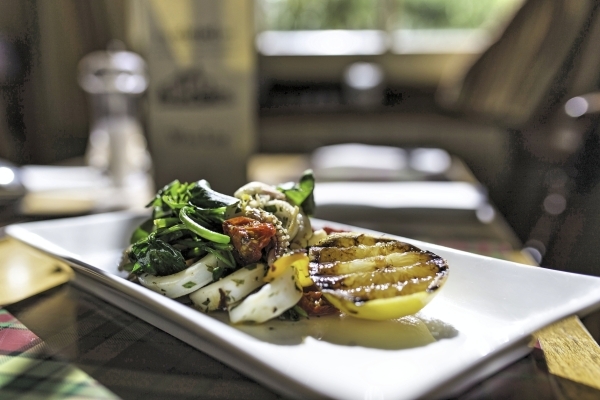 Easy to prepare, fresh and zingy, this summery salad recipe by chef Lisa King of The Elsted Inn near Midhurst combines the sweetness of fresh watercress and sautéed squid with the brininess of fried capers for a delicious lunch or starter. Cut the squid tubes into thin rings, cut the tentacles in half, or quarter if they are large, and set aside. Pour the olive oil into a sauté pan, add the capers and fry until the capers pop open and 'flower'. Add the garlic, sundried tomatoes, chilli flakes and parsley to the pan, toss briefly. Add the squid and toss to combine evenly – the squid will not need more than a few minutes to cook. Once all the ingredients are evenly combined in the pan, add the lemon juice and zest and toss again. Add the watercress and toss again until the watercress just begins to wilt. They're surprisingly easy to make and just as delicious as any you'll find in a jar - give it a try! Halve the sweetest cherry tomatoes you can find, season with sea salt and black pepper and drizzle with olive oil. Bake in the oven at 100C for approximately 4-6 hours or until they have dried out.